ĐÀ NẴNG – The leaders of 21 APEC member economies will meet today to discuss ways to expedite efforts to achieve the Bogor Goals, connect supply chains, strengthen the multilateral trading system, promote regional trade agreements and move towards the realisation of a Free Trade Area of the Asia – Pacific (FTAAP). In remarks made at the dialogue between APEC leaders and APEC Business Advisory Council (ABAC) yesterday, President Trần Đại Quang stressed that it was time for APEC to find out new ways to sustain its role as a driver for economic growth and integration at the Asia-Pacific and global levels. “It is also time for us to build a new vision for APEC as the forum enters its fourth decade of development,” he told APEC leaders and 63 ABAC representatives. “For that reason, APEC Economic Leaders are ready to dialogue with the business community. The recommendations and ideas presented by ABAC will provide an important basis for us to consider and make decisions on APEC’s future direction,” the President said. Earlier, ABAC 2017 Chair Hoàng Văn Dũng presented a report to the APEC leaders, highlighting three core issues for discussion: deeper regional economic integration, facilitation of small and medium-sized enterprises; and application of digital technology. 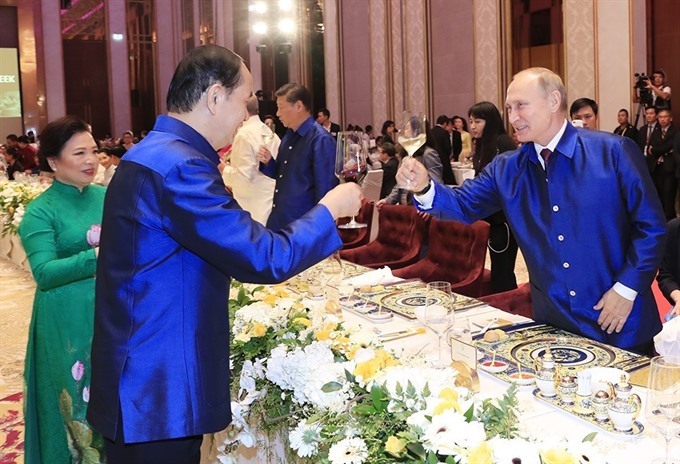 Issues that have attracted the attention of the business community, particularly regional economic integration, connectivity, boosting trade and investment flows, MSMEs, inclusive growth, food security and APEC’s post-2020 vision, are also of great concern for APEC leaders, according to President Quang. They are looking to work out appropriate solutions and practical actions. “Economic integration, connectivity, trade and investment liberalisation have been and will continue to be top priorities for APEC cooperation. All APEC member economies are committed to accelerating efforts towards the Bogor Goals, with greater focus on services, investment and measures to reduce non-tariff barriers. “At the same time, APEC needs to focus more on emerging issues like cross-border e-commerce and the roadmap to an Internet-based digital economy,” he said. 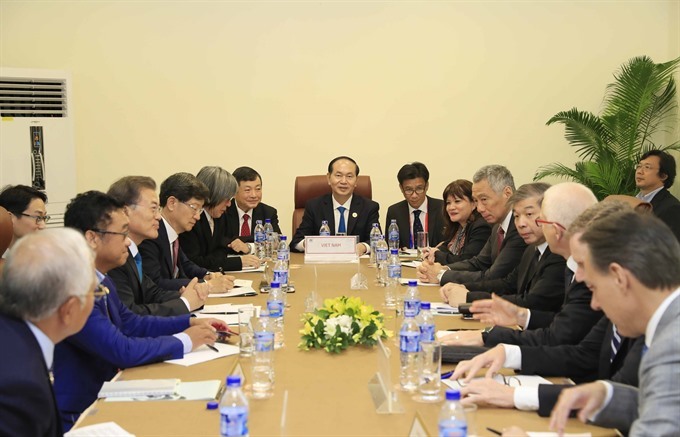 Quang said APEC leaders shared the business community’s view on the need to increase MSMEs’ participation in global markets, improve businesses’ access to finance and enhance women’s economic empowerment. “The greater participation of businesses in general and women entrepreneurs in particular will inject new impetus to foster sustainable and inclusive growth. We are committed to developing effective policy and legal frameworks to create a better environment for the business community,” he said. “Your recommendations on accelerating economic, financial and social inclusion, achieving food and energy security and promoting quality workforce for the digital age reflect the urgent issues to be addressed to ensure innovative, sustainable and inclusive growth,” he added. Following the plenary session, President Quang joined three group discussions with other APEC leaders and ABAC representatives to further clarify policies and solutions to strengthen co-operation between administration authorities and business community to ensure inclusive economic growth, promote MSMEs’ participation in global markets, and make positive contributions towards turning the bloc into an effective co-operation mechanism to accelerate sustainable growth and create jobs for people in the region. A press release issued late yesterday by the Minister of Foreign Affairs also said the dialogue, the first official event in the APEC Economic Leaders’ Week, would involve practical talks between leaders and entrepreneurs. “The forum is now at a pivotal juncture. I call on the business community to continue making active contributions and working with us to accomplish the task to build a new vision for the APEC forum in the decades to come,” President Quang said. 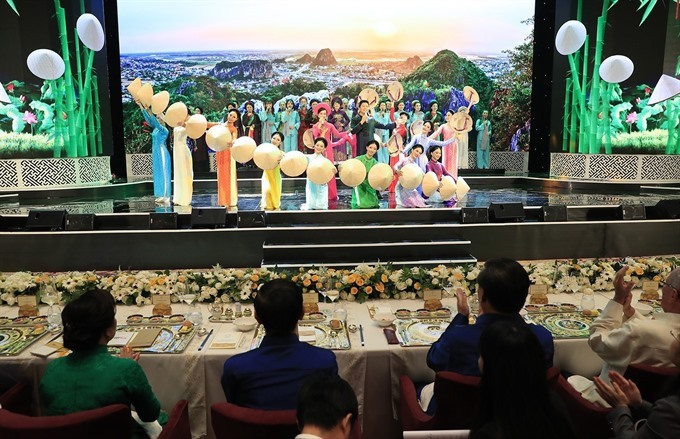 In the evening, the President and his spouse, Nguyễn Thị Hiền hosted a banquet in honour of APEC leaders and their spouses at the Sheraton Hotel, with the feast accompanied by traditional music performances highlighting Vietnamese culture. On the sidelines of APEC, President Quang held brief talks with leaders of several APEC economies, including Russian President Vladimir Putin, Japanese Prime Minister Shinzo Abe, Australian Prime Minister Malcolm Turnbull, Brunei Sultan Hagi Hassanal Bolkiah, Singaporean Prime Minister Lee Hsien Loong and IMF Director General Christine Lagarde. Prime Minister Nguyễn Xuân Phúc also had a busy day with a series of bilateral meetings with Australian PM Turnbull, New Zealand Prime Minister Jacinda Ardern, Chief Executive of Hong Kong (China) Carrie Lam Cheng Yuet-Ngor and leaders of several businesses attending the summit. In talks with PM Phúc, New Zealand PM Ardern pledged to maintain the provision of official assistance development (ODA) for Việt Nam as well as scholarships for students. Phúc and his Australian counterpart Turnbull agreed to upgrade their countries’ relationship to that of a strategic partnership on the basis of enhanced comprehensive partnership and huge co-operation potential. The two leaders assigned the foreign ministries of both countries to continue working on the upgrade so that they could can sign a document on the strategic partnership as soon as possible.